On the 5th June 2015 the Highveld Ridge SPCA Inspectors investigated the farm Roodewal in the Ermelo district in Mpumalanga, after receiving a call for assistance from Ermelo SAPS regarding the possibility that a puppy mill was operating from the premises. SPCA officials found 76 Schnauzer dogs living in fenced enclosures. Although the dogs appeared in acceptable condition the property was not well kept, the staff hostile and the general conditions were not neat and tidy. The owner of the dogs, Mrs Elmarie Celliers, was not present. The dogs were seized in terms of the Animals Protection number 71 of 1962, Regulation 468 and taken to the Highveld Ridge SPCA for care while the investigation continued. Only one sick dog was diagnosed with biliary. Most of the dogs had parasite infestation and were in serious need of grooming. On Monday 8th June 2015 Mrs Celliers contacted the SPCA and offered her full co-operation and assistance while the SPCA continued the investigation. A donation was made to the SPCA for the immediate care of the dogs and she offered to pay for any further veterinary care for the animals. In terms of Regulation 468 Mrs Celliers was given 7 days to contact the SPCA after the animals had been seized. The regulation states that once contact is made arrangements can then be made in the best interest of the animals. In this case Mrs Celliers signed over and gave up all interest in the dogs within 48 hours. 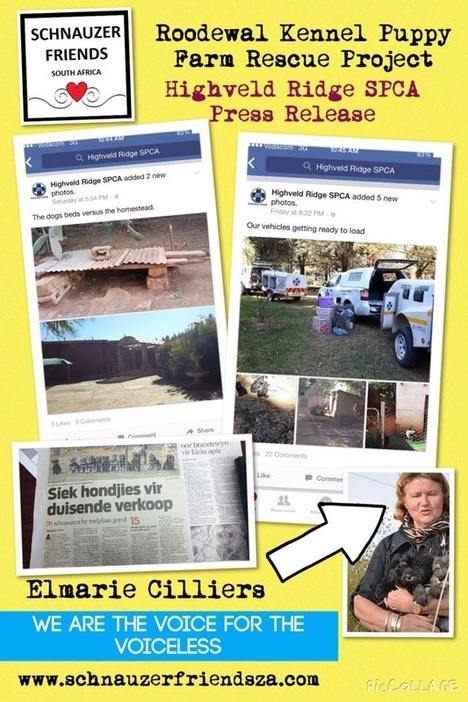 Mrs Celliers has been in constant contact with the Highveld Ridge SPCA and is assisting the SPCA financially with the day to day care of the dogs while the adoption of the dogs takes place in terms of the SPCA rules and regulations. The dogs are now groomed and clean, have been treated for parasites and are responding well to their rehabilitation program. Successful adoptions have already taken place. On 25th June 2015 a further 54 dogs were signed over to the SPCA by a contract breeder to Mrs Celliers and on 30th June 2015 a further 12 dogs were handed over to the SPCA by another contract breeder. The Celliers family and friends immediately got involved and are organizing a fun day to raise much needed funds for the SPCA. The SPCA will continue to investigate Roodewal kennels, at this stage of the investigation there is not enough evidence to press criminal charges against Mrs Celliers. Mrs Celliers apology is acknowledged.